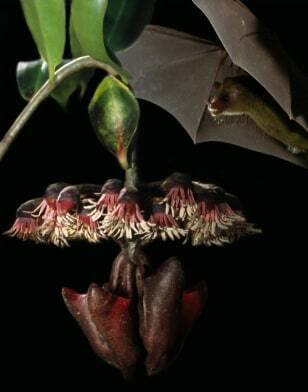 This photo montage shows the Cuban nectar-feeding bat Monophyllus beside the vine that scientists discovered attracts bats by producing an "echo beacon" with a special leaf. That sonar-reflecting leaf stands upright above the ring of flowers. The cup-like structures that hold the nectar hang below.